It is a fingerprint sensor embedded door lock that makes up the week points of lost, robbery and forgetfulness when using an existing key, card and PIN. 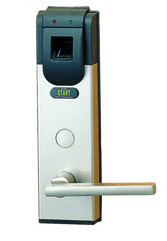 It is entrance and exit control security product widely used in from apartments and general residences to offices, financial institutes and research institutes based on a unique fingerprint recognition system. security fingerprint door lock fingerprint based lock electric strike electromagnetic strike electromagnetic door lock biometrics door lock Biometric Biometric Services Fingerprint services Fingerprint Scanner services. Upgraded emergency key function for an electricity power failure and fire.